Many industry people probably think that the controversy surrounding certain pool plaster problems and whether they are caused by “aggressive pool water versus poor plastering workmanship” is a “he said/she said” situation and that the science is unsettled. Not so. Back in the 1990’s, the NPC’s Technical Manual acknowledged that improper plastering workmanship can cause defects, including gray mottling discoloration, calcium nodules, pop-offs (bond failure or delamination), severe craze cracking, plaster flaking (spalling), and the degradation of plaster. However, a few “new guard” plaster people are now trying to convince the industry that all the above plaster problems are caused by aggressive pool water. Of course, to do that those people are ignoring documented cement science of the past 75 years and ignoring their own Cal Poly/NPIRC study that proved them wrong. In fact, that study provided evidence that poor workmanship really is the culprit for those particular plaster problems, not aggressive pool water. They are also ignoring forensic analysis of actual pool plaster discoloration problems by petrographic experts that identified poor workmanship as the cause. About three years ago, the NPC got together with APSP to produce an ANSI plaster standard. The NPC wrote the draft standard and did NOT include any workmanship standards or acknowledge any plaster problems when faulty practices or materials are used. It contains no limits on the amount of water and calcium chloride (CC) that can be added to a plaster mix, and no limit to water troweling and late hard troweling. It doesn’t even specify the minimum length of time to wait before filling a newly plastered pool. Cement authorities would find that completely irresponsible because those improper practices will cause significant plaster/cement problems. 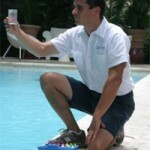 In fact, failure analysis of defective pools has implicated these specific issues in actual pool plaster. As a member of APSP and the NPC, I objected to that draft and provided documented cement science and studies from the PCA and ACI and requested that similar standards for concrete/cement flatwork should be included in the ANSI plaster standard. The NPC complained and stated that adding that information would reduce their profits. Surprisingly, APSP ignored the science, and approved the new standard as written, which gives plasterers carte blanche to plaster pools however they please regarding workmanship with no accountability. That not only invites poor workmanship; but gives plasterers an “out” if the plaster finish turns bad. The NPC claims they are the “utmost authority” on how to produce quality cementitious pool finishes, and yet refuse to adopt any workmanship standards. And APSP claims they promote quality standards for the pool industry and yet did not require that for pool plastering. What happened? Why the “watered-down” standard? The APSP/NPC plaster standard harms pool builders, service techs, and pool owners who are left without the ability to hold plasterers responsible for plaster defects and discolorations. What recourse do they have when ugly plaster problems develop and appear soon after plastering? It is acknowledged that adhering to quality standards will lengthen the time it takes to plaster pools. 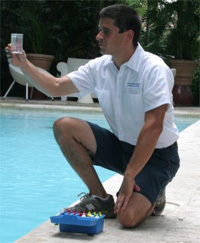 Generally, a plaster crew should spend at least four hours or more to plaster a typical residential pool. If it takes only three hours, that might mean it was done too fast and may result in plaster problems appearing later. During cold temperatures, it may take six hours or more to do the right job. We emphasize that quality over quantity must prevail to ensure the rights of homeowners to quality products, and a responsibility to builders to ensure a commitment to quality of their projects. For a guide on what to watch for during the plastering project, see this article in Watershapes.